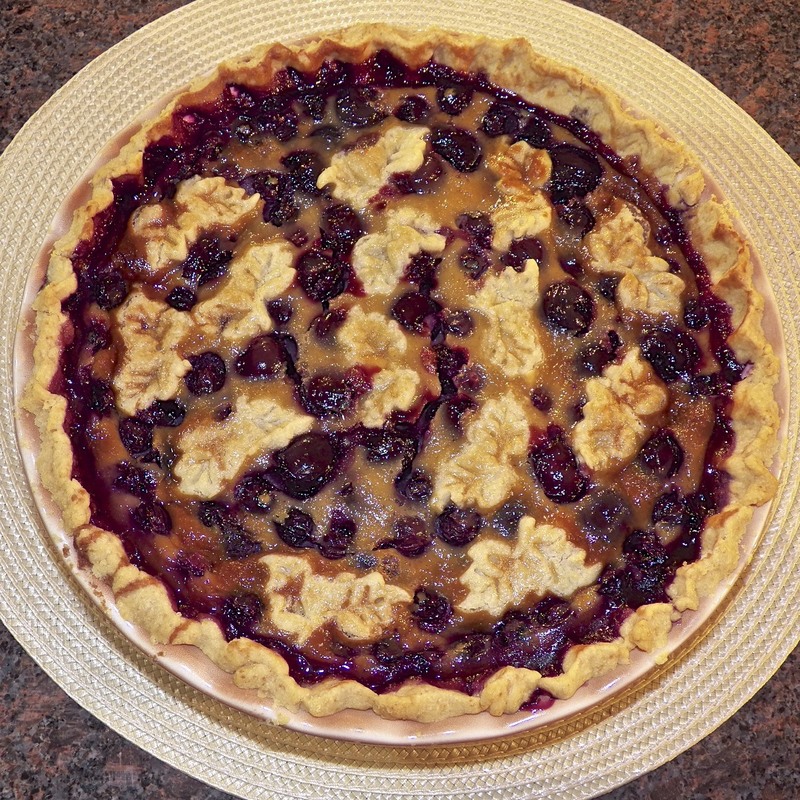 This entry was posted in Sweets (Dolci), Vegetarian and tagged Baking, Blueberries, Cherries, Food, Italian, Pie by ChgoJohn. Bookmark the permalink. Yay.. I’m finally the first to comment (I think?)! 11 pm here is.. I’m not sure what time there, but I’m certain it’s Wednesday:D I was looking forward to your post and was quite pleased to see you had baked something dessertish for us! I think it would only be fair to have a slice of both pies, side by side on one plate in order to be certain which one was preferred. (That’s how we roll in my mom’s kitchen!). But I’m leaning towards loving the pretty little pastry leaves dotted on top of the first pie.. but I’m torn because the flavors of the second pie sound more to my liking.. sour balanced by extra sweetness in the honey sounds heavenly! I’m just picturing you and your doggy sitting in a darkened room, shades drawn.. fans and A/C blasting, savoring every bite of these pies (pup got a taste did he not?) and I’m envious! ps I see Lidia’s website also has a “Blog” as well. I think she should write how she was shopping in a lovely market and who should she run into.. but the famous Chgo John!! As first responder, you can expect a lovely Bartolini Kitchens vegetable peeler (slightly used) to be arriving in a few business days. Enjoy! I was, initially, very disappointed with those leafy things. When that pie came out of the oven, the egg mixture had expanded so much that the leaves weren’t noticeable. What a waste of time! As the pie cooled, they became more apparent. I liked the coloring of the 2nd pie so much more that I didn’t want to cover it with anything. Tart cherries are so much more red than are the sweet. We are right at the beginning of the first weather shift. The highs for tomorrow and the next few days will be in the 70’s F (20’s C), for the first time since May. With rain forecast for two days, I think we may be through with the high heat for this year. I certainly hope so and that Celi gets some of this rain. She and her neighbors sure have had a rough time of it. Lidia is a Goddess and I am so not worthy to meet her. I’ll just have to be happy being able to work with FLat Ruthie. 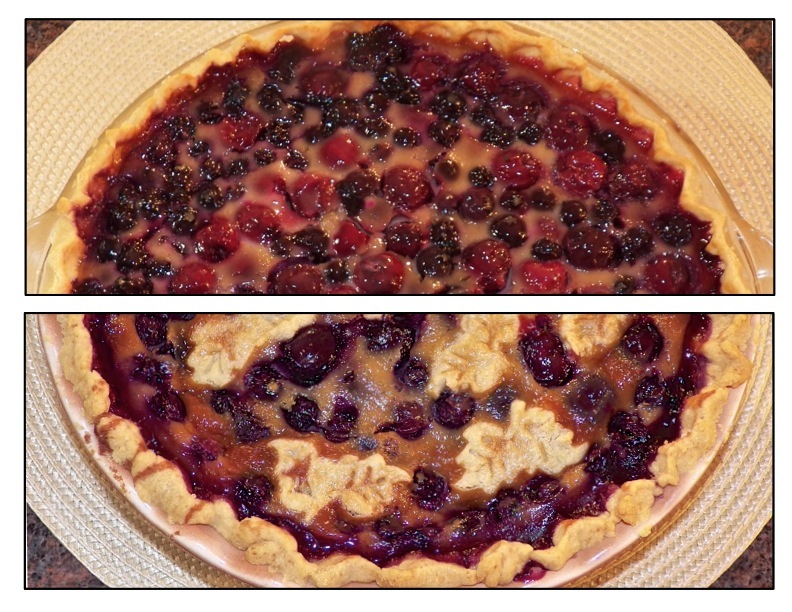 Pie never goes to waste around here, but I think version two looks better: I have a soft spot for tart cherries. I agree with you, Sharyn. Tart cherries are my preference for pies, ice cream, and muffins. Luckily, just around the bottom of the Lake and into Michigan, there are plenty of farms from which to purchase them. Although they’re out of season now, many farms sell them frozen. They are much cheaper than the frozen ones available at the farmers market. Of course, once you figure in gas fare, the “deal” aspect diminishes greatly. If I go, I buy quite a few pounds for myself and neighbors. It’s the only way to make it economically worthwhile. Since we can’t get them here, fresh or frozen, we buy canned sour cherries packed in water by the case for making pies. I did the same thing, Sharyn, for years. One time, on my way home from a visit with Mom, I detoured into cherry country and bought some. That was it. Why buy canned or bottled when fresh are so readily available? One of this area’s advantages is that it is so near to Michigan’s fruit belt, giving us access to some of America’s best stone fruits. Granted, it is nothing like what’s available to you in California but it is still something to take advantage of each summer. We have many cooks who prepare Italian cuisine on our televisions. Lidia is one of them and I consider her to be the real deal. She always identifies a dish’s origins and none of her dishes are over the top. In many ways, she cooks the way the women in my family always cooked. Without cooking either of them I can see that your version is so much more delicious and summery! Stay cool in the heat wave! Thanks you. I definitely preferred it. Our heatwave is leaving us, even as I type this. Our temperatures will drop into the low 20’s C for the rest of the week. Ahhhh! I like Lydia’s cooking show on Create Channel of PBS. I love to watch her work. I would have no problem eating either pie. Fab recipe, thank you for taking one for the team and trying both versions. Very selfless of you. “Selfless”? First time I’ve heard that used when in reference to me and pie. 😉 I’m just sorry there wasn’t a 3rd option for more testing. I really enjoyed this round. I would welcome a heat wave right now John. It is so cold today that I am sitting in bed working with the hot blanket on high – not to mention the 3 pairs of socks I am wearing and the two jackets over my thermal vest and shirt – I am a sight to say the least but am nearly defrosted – yay! Well, the heat is finally leaving us, Mandy, and maybe it’s headed your way. It has to go somewhere. You mean you haven’t gotten your pie yet? I sent you 2 of the most luscious pies I’ve ever baked. If I were you, I’d go to you post office to register a complaint. While you do, look around for the tell-tale blueberry-cherry stains on shirts, blouses, or around the mouth. What is our World coming to if one blogger cannot send pies to another? My favorite pie is cherry pie. Neither of these would go to waste at my house. I think they both look delicious. I’m impressed you made two! Wish I could’ve been there to taste both! Believe me, I had no intention of baking 2 pies. The first one, though good, just wasn’t what I had expected. While I could still get the fresh tart cherries, I just had to try it again. I am so glad I did! I’ll bake the 2nd pie every year when tart cherries are in season. It really is that good. I too will need a slice each to make side-by-side comparison. My preference would be the 2nd pie but with less honey. Who in the world would give a rose the name “stainless steel”????? She is gorgeous and love the unusual color. Don’t think I have seen a rose with that color. You know, Norma, I would probably do the same. I didn’t use too much but less would have been better. Isn’t that rose special? I got it solely because of the color. If you look again at that bloom, though, Norma, you can see it’s little bit discolored around the edges. That was the first indicator of problems within my rose garden. Depending upon the bush, some are doing better now, while others worse. Our temps are dropping now and I hope I can get things back in shape before the first frost. John have you ever been to NYC? IMHO the best city in the world!! Yes, I’ve been to NYC several times and enjoyed it each time. There really is no place like it on Earth. Oh yeah! Now we’re cooking with gas 😉 This is a great recipe and one I can even do!!! Oh, yeah, Teri. This is an easy pie to make. You don’t even need a top crust. It doesn’t get much easier than that! When Hubby was young and living in Brookline, he shopped at the same meat market as Julia…yes, THE Julia. He used to see her there from time to time. Only a good cook would have noticed the difference on how to prepare this pie. A great cook would have made it their own as you did. Thanks for offering us both recipes. I think I will try your version. Thanks again for sharing another good recipe. The pie looks gorgeous! ll the colours melt together. And Lidid Bastianich is food tv royalty. I envy you. You have walked the same path as her!! Hahahaha! I loved her on the second season of American Masterchef. I like her better than Joe anyday! I love the cross section of the two pies. I used to live opposite an old restaurant in Barcelona called Los Caracoles, famous for having coal fired ovens to this day. Several years after I lived there I saw a Keith Floyd show, where he went to Los Caracoles to cook – it was definitely filmed while I lived there – I wish I’d known at the time. Amazing! Floyd evidently loved the place – he went back there several years later and filmed it again. Imagine how hot it must be cooking there in summer time – the coal oven/cooker is enormous. See here 05:06 – the soot from the fantastic wood burning rotisserie used to fly up and into our apartment, making everything filthy! Enjoyed that video. Maybe it was the angle from which it was filmed but that seemed like an awfully small kitchen for the size of the restaurant and its seating capacity. I hope they shoved Floyd off into a small, less used part of the kitchen otherwise they’d need Flat Ruthie to get everyone fed every night. In those days it was a dangerous street – the police would spend 2 hours a day (outside Los Caracoles) filling a van full of the usual suspects. There a far more dangerous things in Barcelona – the most fun being the Correfoc – you don’t wear your best clothes because you get lots of little burns in them! Thanks for sending me the links, MD. I never would have known of them otherwise. Two gorgeous pies! I love the pastry leaves on the first, but I’m sold on the extra fruit in the second one. yum! Thank you, Korena, The tart cherries were so much more colorful, a brighter red, that I didn’t with to cover them up, even with a few leaves. And you’re right, the extra fruit was a very good thing. Whooda thunk that I’d be standing a couple weeks ago where Lidia once stood. I’ll have to bronze my flip flops. I do enjoy cherries but I love blueberries so so so much more. Could I make this with just blueberries? Hey, Chris. You sure could make this with just blueberries. But if you’re going after a blueberry pie, I’d look for one that just uses blueberries without any custard. You’d probably like that one more. Ohhhhh I hope Hubby doesn’t see this post until the weekend! If he does, he will be so sad that we have no berries at all in the house. (I may have relaxed my grocery shopping duties this past week, 😉 ) Hubby is not only the pasta maker in the house, he is also the pie maker/lover and I KNOW he’ll have to make them both….for an objective opinion, of course. It will be a great weekend (weather-wise) to finally do some fun baking like this. 80 degrees we can handle. In fact it’s gonna feel cold, relatively speaking. Thank you John! I did enjoy the 2nd pie much more. That egg taste was just a bit too much for me in the 1st. That’s why I love living in ‘merica, where you can eat and enjoy whatever pie you want. And yes, the weather is supposed to be fantastic for the rest of the week, maybe even a shower or two. I need to bake something, even tater tots, anything to be able to turn on the oven. Welcome back, Kay! Give the 2nd option a try. You may not even care to try the first. I know if I had baked it first, I certainly wouldn’t have looked for an alternative. Have a great week, Kay. 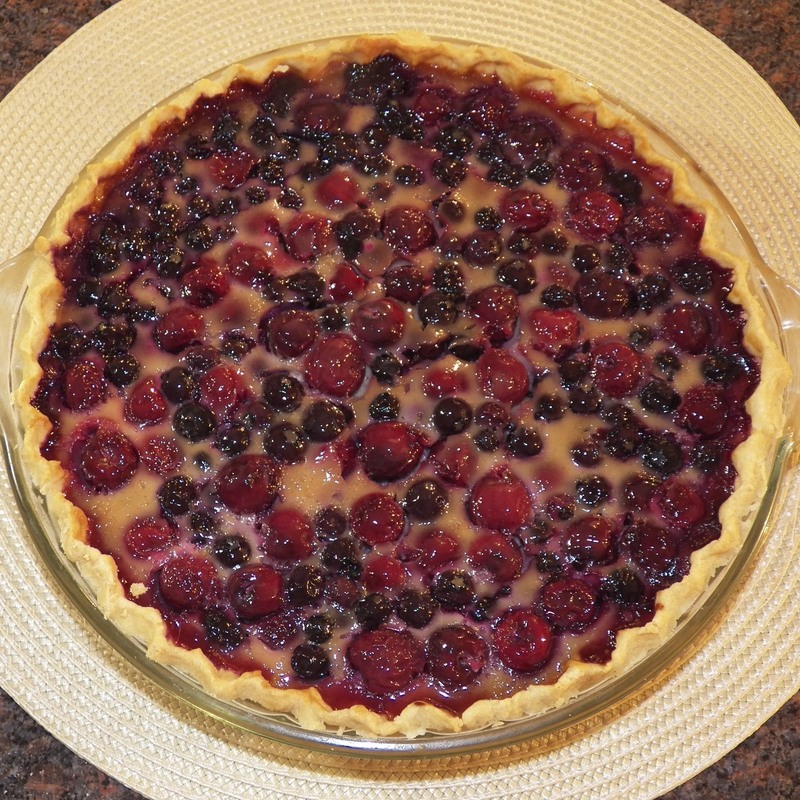 Anyhow…untasted, I’d give my vote to the Pie behind curtain Number 2…no pie, other than a quiche, should be eggy (IMO), and for a pie, oh my, tart cherries! I do love your willingness to return to a recipe several times (eating every last morsel, bless you) to get it just right for the likes of us! Thank you John! I so agree about the eggy. Some comments after the original recipe said it tasted like a clafouti. Never having had one, I cannot say. If those comments are correct, though, then maybe a clafouti isn’t for me. The 2nd pie was just so much better, from the eggy vantage point, That alone made it a winner for me. Thanks, Spree, for leaving such great comments over the past couple days. Oh, Yvette! You must make yourself a cherry pie. I myself prefer using tart cherries but to each her/his own. You must experience the joy of taking your own cherry pie out of the oven, waiting for it to cool, and then tasting that first piece. Pure heaven! Do yourself a big favor. Bake a cherry pie! Have a great, pie-filled week, Yvette! John, I would try both pies regardless the recipes: they look fantastic! More berries better for me! I loved your introduction with Lidia story, I watch her shows from time to time (when I am in a hotel or at friends house as we don’t have cable subscription), and I mostly enjoy her Italy shows. I will try the second recipe this weekend when my husband returns from the east coast. I may have to use dairy free yogurt in place of the sour cream though…we’ll see how it goes. They do make a dairy free sour cream but it just tastes weird! Maybe it would be hidden by the cherries and blueberries though. Well, now I’m just thinking out loud! Hope you have a lovely evening! Glad to read that you received notification of this post without problem. May this continue! I thought about using Greek yogurt in the 2nd pie and probably will in a future iteration. I didn’t because I wanted to first replicate the recipe as best as I could. After that success, I feel free to mess around with it. If you do use yogurt, please let me know whether you like the results. I think it will be delicious — and DF! YAY! Lidia is one of the best. Her recipes work, and they’re good. The second recipe definitely reads better; but of course I need to do a side-by-side taste test so I can tell for sure. Might have to bake a 2nd batch of pie just to make sure – one can’t be too thorough in these things! Fun post – thanks. Yeah, I agree with you about Lidai. Big fan here. I like that she’s not at all pretentious and that her recipes are simple. Hers is the food I was raised on. I really enjoy cherry pie. Having to make a second pie was a lucky turn of events, I must admit, and one that ended up with a great pie. I can’t complain about that. One must never waste pie! I agree that I wish the first pie was better but, if it had been, I never would have tried making the 2nd — a pie that I really like. It all worked out in the end. I’m impressed! When I try a recipe, if I don’t like – it’s out of here! I’m very impressed how you took a recipe that you really weren’t that crazy about and adjusted to make it exactly what you wanted! I definitely like the look of the second one better – not so eggy and definitely more fruity! It looks delicious! Depending upon what is involved, I’ll often do as you do. One and done. But I really like cherry pie and blueberry is a close second. Having both in one pie was just too much not to give it another shot, especially when I thought I had identified the problems. I think I was really rewarded for the effort. I’ll be making the 2nd pie again, no doubt about it. You are so right, John. Wasting pie would be a sin. And these pies look divine. How exciting to know that Lidia was right in your space, your market, your place. But what is with the Stainless Steel rose? A beauty for sure. I always wonder who names the paint when I read the paint chips but who names the roses? I think a third pie should be on the list of things to do and switch up with what fruit is in season next. Peaches and sour cream sound good to me. Whoever cultivates a rose can name it, I believe, so long as the name hasn’t been used. The American Rose Society (ARS) is the guiding hand behind it all, much like the AKC with dogs. If I google a rose like Stainless Steel, I can soon find out what roses were used to develop it. 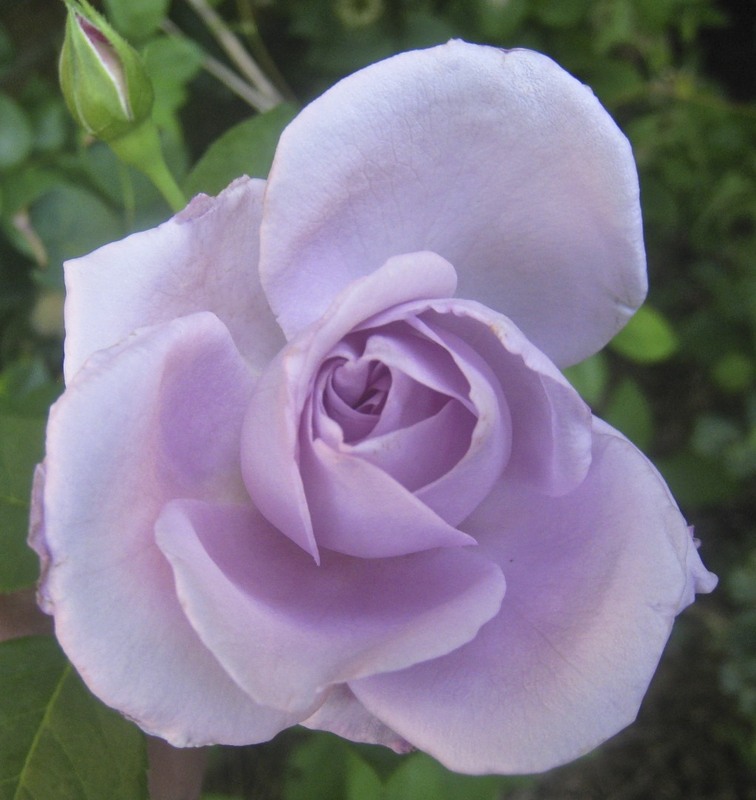 The name itself may point to that rose’s parent(s), its color, or both and, of course, there are roses named after celebrities and people of import. It’s amazing how may “celebrity” roses are out there, although some are no longer grown and others must be bought from vintage rose nurseries. LOL. You know my friend I really enjoy Lidia on the old tube, but I’m not sure I would get that excited about breathing the same air. 😉 Though I do think it is very cool that she was at your market. Thanks for sharing two dangerous desserts! Thanks, Jed. I understand that not everyone joins me in my devotion to Lidia, to each his own. In fact, just last week, I saw Arnie Palmer and Jack Nicklaus sipping espresso at Caputo’s outdoor cafe. I didn’t think much of it but I’m sure others might. And oh the ,lengths you go to for our benefit,, making and eating not one but two pies John, polish that halo !! I liked the sound of your second one – good and fruity! I saw this post the other day and only have time to comment on it now. I take my hat off to you John for your perseverance, I likely would have given up when the two recipes proved inconsistent; it makes me want to bake the second pie, mainly because you seem to have favoured it. The rose is incredible, you must have a wonderful garden. Do you keep it fenced off so Max can’t get into it or do the thorns deter him? Lidia’s show is one that I haven’t seen here, and now we cancelled our cable (don’t ask) I’ll have to check it out on line. It’s very cool that you actually walked in Lidia’s footsteps at your market; it must also make you feel really good that she thinks highly enough of your market that she showed it on her show!! Oh, Eva. It’s not so much perseverance but a love of cherry and blueberry pies. The chance to combine the two into one pie was just too good to pass up. And I just couldn’t let things go after that first attempt. I can be stubborn that way. I’m very glad I did try again because now, every June, I’ll be making this pie, no doubt about it. All Lidia jokes aside, what really got my attention is that the area is a suburban Little Italy. I had no idea nor had any of my friends. I’m still exploring the area. hoping to find a good butcher. Thus far, I’ve found 2 bakeries, a fish monger, home-made pasta shop, cafés, and restaurants. I can’t believe that I’ve lived here over 30 years and only now do I find out about this area. Who knew? That’s the cool thing about a big city, John, that there are little hidden gems everywhere. You must let me know exactly where this gem is so I can make a special trip next time we get down to the city. That’s very funny about Max, I can just see the pile of mulch in the middle of the yard, for now apparent reason. I would definitely prefer your second, less eggy version myself even though I’m sure they are both very good. I commend you for baking in all the heat that you have endured. Let’s see. 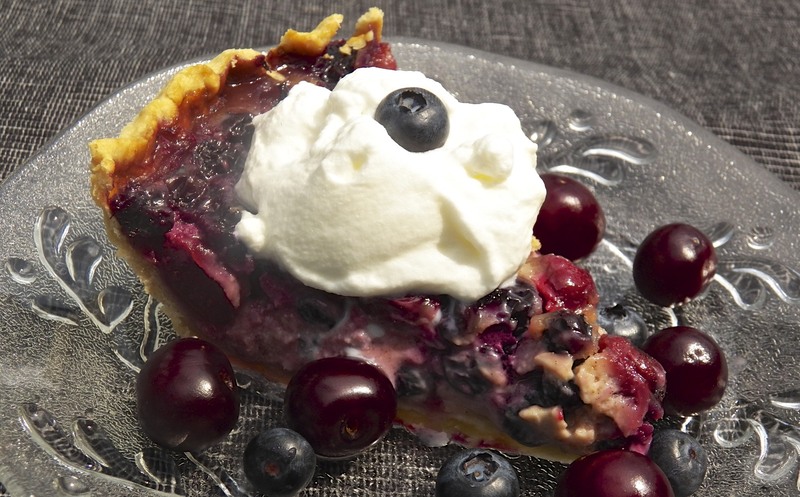 You put Cherries, Blueberries, Sour Cream and Honey, all in one pie. FOUR of my favorite foods in ONE pie! I really need to make this but yesterday it was 108 F with a barometric press of 29.92 and humidity of 30% in the dead of the afternoon! Definitely not a baking day and there is more of this on the horizon. If cherries are still in season when it cools off a bit, I will try the less eggy version and let you know what I think. Great post. There are dishes I like with the sweet cherries but then there are those that the sour cherries make the dish. I may have to wait until next year’s cherry season to make these pies but I will and will let you know what i think when i do. You’re so right, Richard. For me, a tart cherry pie is one of Life’s true pleasures. I really look forward to them coming into season each year and then take full advantage. We’ve had more than a little rain and, with the wind off The Lake, things are pretty cool here. Blissfully cool. You had all of us worried that day you came awfully close to having heatstroke. I think you’re right, though, and believe we’ve turned the corner. There may be a couple 90˚ days but the real scorchers are gone for the year. Still, let’s not rush Fall into the picture. Our winters are so long that I’d like Summer to linger as long as possible. I’m no star, Celi. I just love cherries and blueberries. The idea of having a pie with both in a custard, of sorts, was just too good to pass up. I would have made a 3rd pie if the 2nd hadn’t been so successul! We love Lidia too. Very cool story. Beautiful recipe too. Thanks, Greg. Although the self-portrayal is a bit over-the-top, I will credit her and that episode for showing me another Little Italy. Every week I go over there, I find another shop to explore. I have access now to some things I’ve not seen since I lived at home. It’s been a great experience. First off, your rose looks ethereal. So lovely. Why don’t I have a rose garden? (Or a tomato garden, but that’s another story.) Secondly, I’m with you on not wanting an eggy pie for dessert. An eggy pie is quiche. So glad you persevered and made the second pie and shared the recipe with all of us. It looks amazing and I can imagine how very good it tastes (eh)! Hello, Mar. In total, I’ve 13 roses, although I’ve a feeling that number will change this Winter. Some just aren’t doing well. My yard is a typical, for Chicago, small yard. I’ve a dog run that takes up a good portion of it. The roses border my yard and, unless I tear out the little bit of grass that I have, there simply is no place to put a rose garden. Not only that, but they’re spaced with the minimum suggested space between each so 13 rose bushes is all there ever will be. Freezing some of those cherries next year is a good option to be able to make this pie in the winter. What a way to escape the snowy reality outside the window in those cold months! I hear you about the small yard. My lot here is half the size of my last place, plus there’s a garage and the house has a bigger footprint. So, I have a very small yard which is great in some respects but challenging for the gardener! Not to mention we’re surrounded by trees, which I love, but that means the yard is quite shady. It seems we gardeners always have one challenge or another to overcome! Hi, Kristy. I just finished the last of that 2nd pie for dessert tonight. I froze pieces of it because even though I love pie, 2 of them in 2 weeks was a bit much. I agree and think the really hot weather is gone now until next year, at the earliest. Now begins my favorite weather of the year. Not too hot, certainly not too cool, simply perfect! Well, had that first pie tasted better, I never would have gone on to pie number 2. Still, I’m very pleased the way things turned out and will be returning to this recipe again. Thanks for dropping by and taking the time to comment. That Stainless Steel is a real looker John. Love that color! Anyhow, so glad you hung in there and made the pie you were born to make or at least the pie you had dreamt of. Both look fabulous but the less eggier version does appeal to me more. I just had a similar experience this weekend with orange curd and Ina Garten. I had watched her make an orange curd…didn’t much remember the details except that I wanted to make it. When I pulled up the recipe it called for whole eggs. Whole eggs? I have never heard of such a thing in a curd…usually it’s only egg yolks. I made the recipe as dictated and it never thickened. I found myself having to add 2 T. of cornstarch which took the sheen out of the curd and left it a teensy bit gritty. That being said, my guests were thrilled with my “take one” of my curd tart. Next day, I needed to remake the curd to get it right and found a Martha Stewart recipe that meshed with my own knowledge of curds. This one was perfect and I was a very happy camper. Isn’t it grand when you can get the end result you really seek and crave?! Hard work and stick-to-it-ness really does pay off. 🙂 Happy Monday! Isn’t she a beauty, Geni? It’s the color that drew me to her. Once I got “my girls” planted and established, the rest of the roses were selected by color. I’m almost at the end and hope you’ll like the next few. And you’re so right, “stick-to-it-ness” really does pay off. Granted, if the pie had used something other than cherries and blueberries, I probably wouldn’t have tried to make it again. 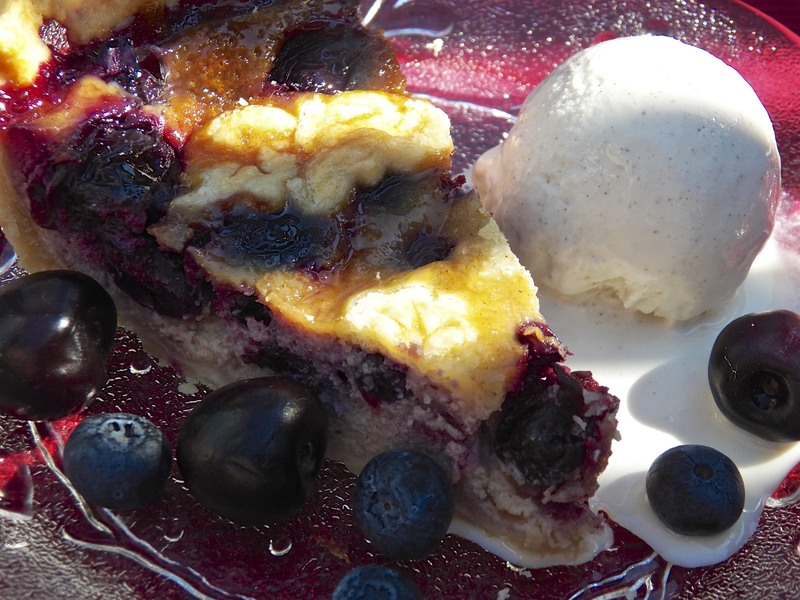 But, I do really love cherries and blueberries that I would have made a 3rd even a 4th pie, if need be. Yes, that is the tart. Martha Stewart saved the day and the curd, but I will never stop adoring Ina…I have mostly had great success with her recipes. Well, whoever’s it was, that was one fantastic tart! It looked delicious! I have to say I will go for version 2. I can’t stand any baked good that is even slightly eggy and I love the color of the second one. Thanks, Sawsan, for always leaving such nice compliments. I’m sorry, Debra, that you lost me but am happy that we’re together again! 🙂 This is so annoying. I hope WP finds out what’s going on. Because of our location, we have 3 separate PBS stations broadcast and Lidia is on 3 times weekly. This is how I ended up with such a backlog of episodes to watch. Such a problem, eh? You version definitely takes the cake (pie) =D!!! Thanks for stopping and taking the time to comment. What a wonderful comparison of pies!! They both sound delicious, but I’m a sucker for sour cream pies 🙂 Love your side by side picture! Thanks, Kathryn. “Stainless” was one of the last that I planted and it was chosen just for the color. Depending on the light, it shows tinges of blue or gray. It’s a beauty, eh? Summer is over, here, but I may buy some tinned cherries.